Krank is a completely secure online networking platform where you establish each connection in private. Your business creating multiple private trading networks with other businesses, allowing you to buy, sell and collaborate. What is a company to company network? A company to company network is a private network connection between your business and another. Can another third business see the connections my business has with other businesses? No, Kranks architecture is built with absolute privacy in mind. It is impossible for each of the businesses yours is networked with to know that each other exist, unless you tell them. I’ve completed the registration steps but haven’t received a verification email from Krank? If you haven’t received a verification email from Krank to your inbox, please check your junk or spam box as your server won’t be used to receiving traffic from Krank. If it is in your junk or spam box, please mark the email as ‘safe’ so that all future emails from Krank hit your inbox. If the verification email is not in your junk or spam box, please contact us at [email protected] and we’ll get our technical team to take a closer look. The email address that you want to be associated with your Krank account will automatically be your login username. I've forgotten my password what should I do? If you've forgotten your password, hit the Forgot password button forgot password button on the login page and enter the email address you used to register on Krank. You will then receive a reset password link by email. How can I delete my company's account on Krank? In order to delete your company's account on Krank please contact us at [email protected]om directly. Deleting your account will also delete all of your employees from your account on Krank, their personal profiles and their listings. What happens to all of the information we have posted on Krank when the account is finally deleted? Once your account has been finally deleted, all of your information including personal profiles, all news items and listings will be deleted. What is my Company Profile? Where and Who can edit my Company Profile page? Who? Anyone can edit your company’s profile page, but we would suggest you create internal rules for the management of the page. Where? By clicking on your general drop down menu, in the top right hand corner of your screen which you can access by clicking on your profile picture. How can I edit the company banner picture on my company profile page? Look at the top right hand corner of your company banner picture window pane and hit the camera icon. Then choose the picture from your computer that you'd like to upload. We recommend you choose a strong image, one that you're proud of which would ideally be a landscape image, no bigger than 5MB for a faster upload. Recommended image size: 1260 (w) pixels x 390 (h) pixels . How can I edit my company's logo image? Click on the square in the middle of your company banner image pane where the logo will sit and hit the icon. How can I edit the following items in my company profile settings? What is share an update? This is where you share a news update, product launch or even the joke of the day and choose from the publishing privacy options who to share it to. How can I upload a photo? To upload a photo, click the upload photo button and choose the image file from your computer. Can I delete a photo post once I've made it? Yes, you can. To delete a photo post go to the post in your newsfeed and hit the trashcan icon button in the top right hand corner of the post. Why won't the photo I've chosen upload? What is a share link post? You can copy and paste links to articles you've seen somewhere as well as YouTube and Vimeo video links. Once you've pasted the link hit the post button when you can see it in the box. Can I delete a link post once I've made it? Just hit the trash icon in the top right hand corner of the post. What does the Tag Connections button do? When you tag one of your connections on Krank in a post, the person you have tagged will receive a direct notification containing a link to the post. Tagging connections will ensure they see your post if they're on Krank. I want to tag a connection but their name doesn't appear? How can I find new connections? 2. How do I invite my co-workers to join our company’s network? Can anybody else see who I am connected with? Only you can see your connections, nobody else. Can my networks see each other when networked with my company? How do I invite my trading partners / companies to create new networks with? How can I delete a connection? To delete a connection, go to My Connections. (To make it easier to find them you can sort your connections by network) Once you've found the connection you want to delete, roll your cursor over the profile picture. When the profile picture goes red, just hit the button and the connection will be removed. When I delete a connection will they still be able to see my listings and my posts? No, once you've deleted a connection they will no longer be able to see anything that you publish and you will no longer to see anything they publish. Can my connections see each other? Only your company connections can see each other on Krank. Your different network connections can not see each other. What is a dealer network? A dealer network is used by a manufacturer or large company with several branches to appoint their dealers or branch offices as designated dealer networks. Once dealer networks have been formed listings can be ‘assigned’ to dealer networks for greater coverage in advertising. You will either appoint a dealer network or you will be appointed as a dealer network by a manufacturer or your head office. Where can other networks find my dealer networks? Your dealer networks will be advertised on your company profile pages. If I am an appointed dealer network of a manufacturer or my head office, can my other networks see this? Yes, If you appointed a dealer network this will be advertised on your company profile and also through your newsfeed when you are appointed. How can I see which networks my company is in? Every time a new network request sent from one of your company's employees to another business and is accepted, your company has a new network. Every time someone authorised in your company accepts a new network request from another business, your company has a new network. All of your company's networks can be found by clicking My Networks at the top of your dashboard page. Also, when a new network is created between your company and another business, every employee of your company who is on Krank and every employee of the other business who is on Krank will receive a post confirming the new network. Each company's profile in the new network and their connections can be viewed from the buttons in the post. What is a network group? A network group is where you can create a group of networks almost like a speed dialler list. Creating a group of networks allows you to post news items, product updates and listings and just share them to specific groups of networks, rather than all of them. How do I create a network group? To create a network group, click on My Networks at the top of your dashboard or select My Networks from your dashboard menu. Click on the Network Group button, or if you don't have any groups yet click on the Create/Edit Group button on the top right hand side of your networks page. To edit a group, select the group to edit or to add a group, type the new group name, type the names of the networks until they appear. When they appear click the full network name with it's logo and continue the process. Once you've finished make sure to click the Save button to save your new group. If I create a network group, can each network in the group see each other? No, creating a network group does not impact the privacy hierarchy of your private networks. Each of your networks are completely private and independent. Creating network groups is just a convenient tool for you. How can I delete a network? To delete a network from your company's Krank account, you have to either be a line admin or the company's super admin. Remember once you delete a network from your company's Krank account, you are deleting it for the whole company. To delete a network, hover your cursor over the networked company's logo. It will turn red, click and the network will be deleted from your Krank account. If I delete a network from my company's Krank account will the network I've deleted still be able to see my posts and listings in their news feeds? No, once you have deleted a network and your two companies are no longer in a private trading network, neither company will be able to share any news or listings unless they are available through the company's public newsfeed or in the case of listings available in the public marketplace (although your company's details will not be visible). How do I create a sale or rent listing? Select x Sale or x Rent depending on which type of listing you want to create and follow the steps in the form. When I am creating a listing, there is no sub-category that matches my equipment, what should I do? If you've chosen a category, e.g. 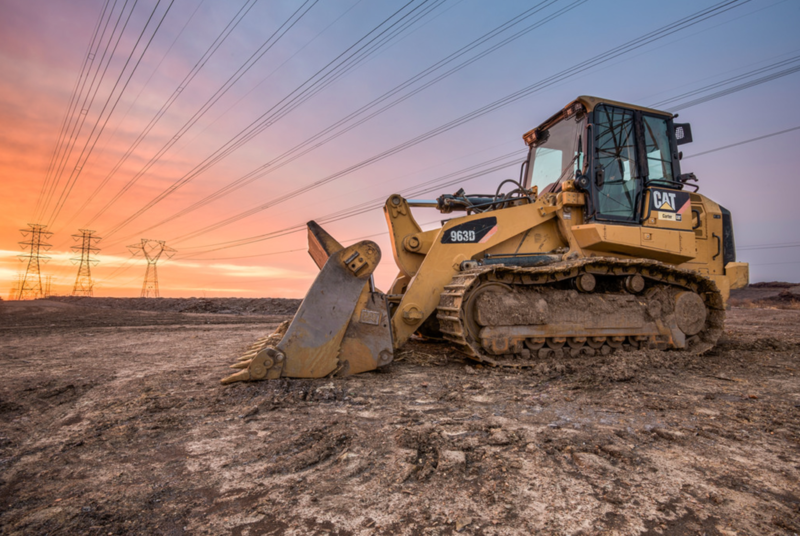 Earthmoving & Compaction and there is no sub-category to match your equipment, just select ‘other' and continue to follow the steps to create your listing. The manufacturer's name of my equipment doesn't appear in the auto-fill drop down menu, what should I do? How can I add a spec sheet to my listing? To add another spec sheet, repeat the process above. How many spec sheets can I include in one listing? You can include 2 spec sheets per listing. My town is not listed in the drop down menu of towns and cities for my country, what can I do? If your town or city is not already listed in the drop down menu for your country, hit the Add your city button in the location tab of add listing. Be sure to enter the correct spelling and Krank's database will store it so you will not have to repeat the process a second time. How many pictures can I upload on one listing? We recommend no more than 10 images. Make sure you upload good quality pictures of your equipment to show it in it's best light. Get your lighting right Light is really important for taking pictures of heavy equipment and even spare parts. If you're taking pictures in bright mid-day sun mean, you'll loose contrast and definition in showing off the equipment. For best results try and snap your shots early in the morning, later in the evening or on bright, but overcast days. Check the background of your shot If you really want to highlight just the equipment, try and keep your background plain. If you're looking to promote the equipment against a backdrop of other parts of your fleet that's also good. Try and avoid distracting images in the background and play around with the perspective of your shot by playing with different angles to show your equipment in an eye-catching way. Your iphone camera is just fine The lens technology on smart phones these days means you can take great, hi-resolution shots just perfectly without the need of expensive cameras. Just make sure you get your lighting right and play with the perspective. Keep clicking away In this case more is better. If you just keep taking shots, you'll at least get a couple of decent ones. You want to get the best price for your equipment and encourage buyers to come and inspect, start as you mean to go on and present it in the best way possible with good pictures. How do I add a video to my listing? Once you've uploaded your listing photos, you then might want to add a video of your equipment in action. To do this, go to where your video is currently hosted, i.e. on YouTube or Vimeo. I've tried to add my video but it's not working? You can only add YouTube or Vimeo URL links, also make sure you hit the blue Add Video button to add your video. 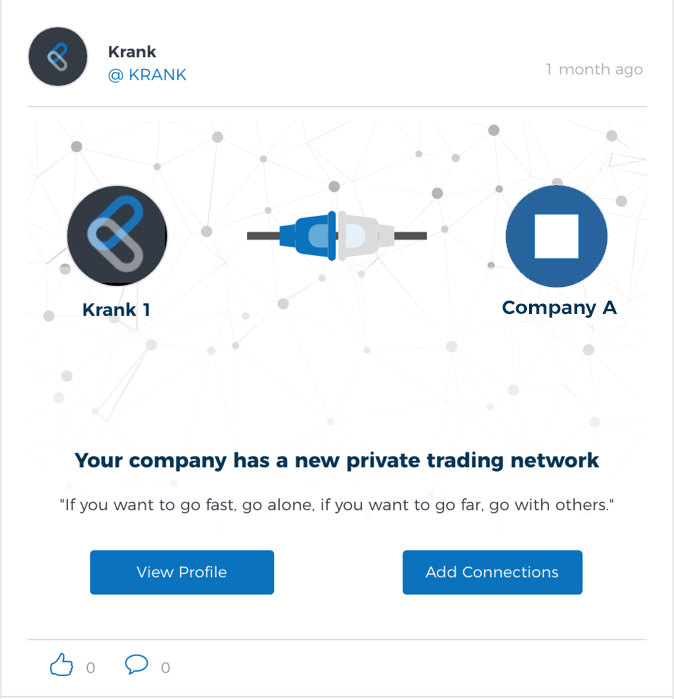 Your listing will be available to all of your connections, all of the connections in your company's different networks and will also be available to view on Krank's public marketplace. Can I share my listing or post on my other social media Websites? Can any listing or post be shared? Only updates or posts where you have checked the option: Publish this to your company profile’s public newsfeed can be shared to your other social media Websites.